Houghton Mifflin Harcourt, 9780544484122, 272pp. DEBBIE CLARKE MODEROW, originally from Connecticut, went to Alaska in 1979 for a mountain climbing expedition and met her husband, Mark. For the Moderows, dog mushing has always been a family affair. Debbie ran the Iditarod in 2003 and 2005, completing the latter in 13 days, 19 hours, 10 minutes, and 32 seconds. In 2013, Debbie graduated from Pacific Lutheran University's Rainier Writing Workshop with an MFA in Creative Writing. 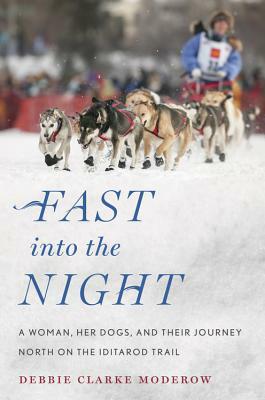 Not only does Fast Into the Night detail in spare and honest prose all the grit and excitement that is the Iditarod, but its author aptly takes us along on her personal journey with all its internal struggles, tribulations, and tumult. At the same time she captures the remarkable bond that exists between a musher and their dogs, and the interplay they must share in order to make their goal of reaching Nome a reality. Bravo for turning out what may be the quintessential Iditarod story, and for crafting what is simply a great Alaskan adventure well told. —Dave Atcheson, author of Dead Reckoning and Hidden Alaska. Personal, vivid, and authentic, Fast Into The Night lives up to its title. Moderow’s ability to project emotion through her graceful prose had me from the start, and never let go. Through moments of failure and triumph, Moderow’s love for family, her dogs, and the grand adventure of life shine forth. —Nick Jans, author of A Wolf Called Romeo. Moderow heard the call of the wild. She writes about racing dogs through the wilderness lyrically like Robert Service writes about seeking adventure in far off places. She heard the challenge, learned the lessons with her dogs, paid the costs, and won the enthralling and inspiring experience. It's a book you can't put down. —Lynne Cox, author of Swimming to Antarctica and Elizabeth, Queen of the Seas. I expected high adventure from Debbie Moderow’s story of running the Iditarod through a thousand miles of Alaska’s most grueling terrain—and happily, I found it. Moderow beautifully captures the personalities of each dog as she struggles to earn the team’s trust, and she reveals her own vulnerabilities as she learns to trust herself. Crossing the finish line, it turns out, requires resilience as much as endurance, humility more than strength. This is an extraordinary account of a family’s faith in one another—four-leggeds and two-leggeds alike. —Sherry Simpson, author of The Way Winter Comes and Dominion of Bears.